In 2018, we saw our membership numbers continue to grow as we welcomed new members to the credit union bringing our total number to 110,658. We also saw record growth in deposits with $94,229,884 growth in 2018. Overall, our assets grew by 14.22% and finished the year at $975,964,204 million. We anticipate that we will exceed $1 billion in assets during the first few months of 2019. This is an enormous accomplishment, especially as we look back on our humble beginnings in Magna with just 22 Kennecott Copper Company employees and assets totaling less than $100. 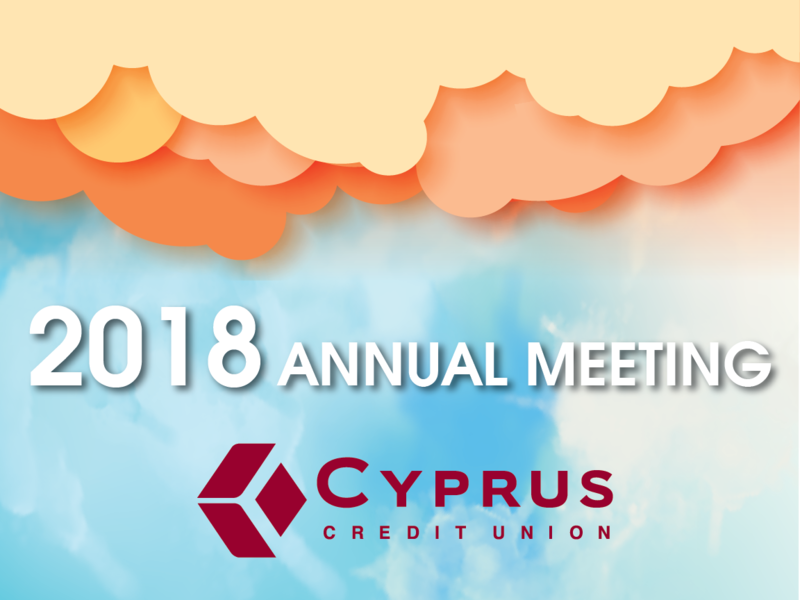 As Cyprus continues to grow, rest assured that your credit union remains secure and stable. Our capital ratio, which is a measurement of our safety and soundness, ended the year at 11.81%. This exceeds the National Credit Administration’s requirement of 7.00% by nearly 4.81%. 2018 also saw the launch of our new line of Dream products, including Dream Checking, Dream Auto/RV, and Dream Certificate. These products were designed to offer lower loan rates, higher deposit rates, and additional perks for members with Dream Checking accounts. We hope that each of you is taking full advantage of these perks designed to improve your financial well-being. In October of 2018, we celebrated our 90th year of serving our members. As the longest serving credit union in Utah, we are proud to have a diverse membership throughout the Salt Lake Valley and beyond. None of this success would be possible without the continuous support of you, our members, over the last nine decades. As we look toward the future, we remain fully dedicated to providing the best financial solutions, products, and resources to our members. I want to recognize and thank Wayne Carlton, who retired from our board of directors after 39 years of volunteer service to the credit union. On behalf of everyone at Cyprus, we would like to thank him for the time and effort he has given to the credit union. To fill the vacancy, Mike Carlton was appointed to the board. We also welcomed Lisa Bonnell and Glenn Tarrant as associate board members. To continue our commitment of delivering superior service to our member base, we are excited to announce that our new Draper branch will be opening this spring. This branch will introduce new technologies to make it easier to do business with Cyprus while providing the same quality service our members have come to expect. Following Draper, we plan to open a new location in downtown Salt Lake later in 2019 and will continue our expansion throughout the Salt Lake Valley and beyond. As we expand and improve our branch network and online accessibility, protecting your personal and financial information remains one of our top priorities. With the addition of new programs, such as our Card Control app, we are constantly looking for new ways to add layers of protections for your financial information. Our professional Information Technology Department, Fraud Department, and 24/7 secure computer networks continue to utilize the latest technology and training available to keep your information safe and secure. As a proud member of the community, we are always looking for opportunities to give back and volunteer. Every year, we partner with the Utah Food Bank to help collect food and money to help those in need. This was our biggest year ever with over 2000 pounds of food collected and over $6,000 donated. This money will used to provide almost $50,000 worth of goods and services to people throughout the state of Utah. We also helped provide Christmas to over 1000 Utahns this year through our Angel Tree program. Through our charitable giving and volunteer work, I am pleased to report that in 2018, Cyprus employees volunteered almost 900 hours and donated over $2,000 to deserving charities and community organizations throughout Utah. Cyprus is also dedicated to improving education in the state of Utah. Our employees spend many hours teaching high school students about essential financial topics as well as the importance of a college education. This year, we granted eight deserving high school seniors with a $1,000 scholarship for their college education. I would like to acknowledge and thank our volunteer Board of Directors and Supervisory Committee who generously contribute their time and energy to ensure the success of our organization. I would also like to thank our dedicated staff who are fully committed to our company-wide effort to be ‘All In’ for our members, fellow employees, and our community. Finally, I would like to again thank our members. It is because of you that we are continuously striving to go the extra mile. We are thankful you are a part of the Cyprus family and look forward to serving you in 2019 and beyond. For the entire 2018 annual report, click HERE.